I was privileged enough to take a travel writer out on the course for the final day of the Masters Tournament last year. As an Augusta resident, I love going to the Masters. It just amazes me that this pristine, beautiful, and surprisingly quiet place is located right off a major thoroughfare in Augusta. 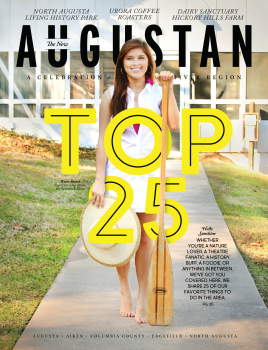 Every city has that major, busy road and Washington Road is Augusta’s. The Augusta National Golf Course is located right off of Washington Road but when you are on the course, it is completely quiet (except for the random roars that echo across the course, that is probably my favorite part…it gives me the chills). I love to take people out on the course and see their reaction to just how beautiful it really is in person (the TV broadcast does not do it justice). It was especially exciting to take someone out on the final day. When we arrived (I would recommend getting to the course fairly early on Sunday, around 8:00 a.m.) we set our chairs up on hole 16. We chose this hole because we wanted to walk around the course most of the day and then return to our seats as the players started playing through. It is very hard to get a good seat on hole 18 and sometimes best just to drive to the closest sports bar to watch the remainder of the tournament. The tournament didn’t start until Noon, so we decided to eat brunch at The Partridge Inn. 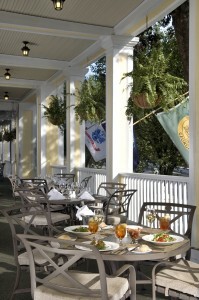 They have a fantastic brunch on Sundays and it is about a ten minute drive from the course. However, if you leave you will lose your parking spot. There are plenty of spaces but you will have to walk a ways if you arrive around tee time. We got back just in time to walk the entire course (which I highly recommend) and get back to our seats to see the first group play through hole 16. We watched all the players play through the hole and hurried to watch the remainder of the tournament on TV. We both agreed that it was a pretty perfect day!